It is possible to say that you have not lived a fully actualized life unless you have eaten a Clark Bar straight off the assembly line. I am qualified to make this judgment because I have eaten a Clark Bar straight off the assembly line. I have eaten two. My guide at the New England Confectionery Company (Necco) headquarters on Mass Ave. in Cambridge was Manny De Costa, the facilities manager. Manny is a slightly puffed version of Norman Schwarzkopf: stern, firm-chinned, capable of inflicting significant damage with his bare hands, though he turned out to be the nicest man imaginable and no danger to anyone at all, unless you happen to be coated in chocolate. Manny had come to Necco as a shipping clerk 35 years ago. Now, he oversaw six floors and 400 employees. He was dressed in a suit and tie, which he accented—for our visit to production areas—with a white gauzy shower cap that sat on his head like a collapsed souffl�. 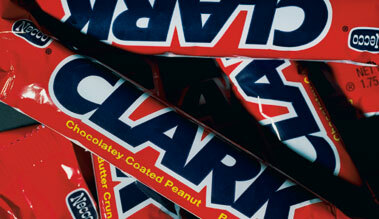 Necco acquired Clark Bar America, Inc. in 1999. A native of Pittsburgh, the Clark was first produced in 1917 and became one of the most popular bars of the post-World War II candy boom. It consists of a crunchy peanut filling covered in a milk chocolate coating. Most people would compare it to the Butterfinger, though it has far more peanut flavor than a Butterfinger and a softer bite. Necco itself used to produce a chocolate-covered peanut crunch known as the Bolster Bar. But everyone seemed to agree the Clark Bar was tastier. This, according to Manny, is because of the Clark's unique production process. Step 1: The staples were boiled into a sticky glop, cooled, and pulled to a beige, taffylike consistency. Step 3: The burrito was lowered into a batch roller, where it was funneled down and came snaking out, ticker tape style, to be cut into segments. Step 4: The peanut crunch was now ready to be covered in chocolate, a process known as enrobing. Enrobing is the money shot of candy production, a sight so sensual as to seem pornographic. The conveyor belt carried the naked Clarks forward, into a curtain of chocolate, which, in spilling down, created the delicate ripples and wavelets you find atop most candy bars. It is this illusion of liquidity that I have always found so seductive; when we look at the top of a candy bar, what we see is a particular moment, the dynamism of the fluid state captured. Step 5: The wet bars were carried into a cooling tunnel. A half hour later they emerged, 100 yards down the line, ready for packing. The entire genesis of the Clark, from raw ingredients to wrapper, took 90 minutes. The fresh bar had a more supple consistency than store-bought. The peanut butter was more redolent. The chocolate coating melted the moment it hit your tongue. "Fresh off the line is a different thing," Manny said. "It's like from someone's kitchen. I eat them all day long. That's why I'm as big as I am." It was precisely at this moment, watching Manny De Costa pat his stomach and laugh in a jolly vibrato while offering me a second fresh Clark Bar, that I considered asking him to adopt me. This feeling was reinforced during our brief trip to the sample shop on the first floor, where Manny and his wife—who, it turned out, worked in the sample shop and was, if this is even possible, nicer than Manny—foisted a shameful amount of candy onto me, which I tried (not very hard) to refuse, and which I seriously considered donating to orphans, before deciding, instead, to eat it all myself. That was my first taste of industrial candy production. I was delirious. Steve Almond teaches creative writing at Boston College. His essay is drawn from Candyfreak: A Journey Through the Chocolate Underbelly of America (copyright � 2004 by Steve Almond) and reprinted by permission of Algonquin Books of Chapel Hill. Anyone wishing to make a similar pilgrimage to the Necco factory should be advised that the company's operations have since moved to Revere, Massachusetts.